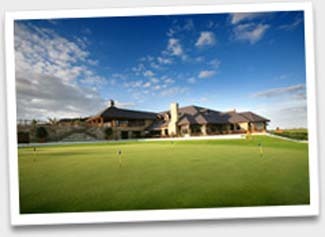 Dun Laoghaire Golf Club sits dramatically between mountains and the sea in Ballyman Glen, a uniquely beautiful valley on the borders of Counties Dublin and Wicklow. 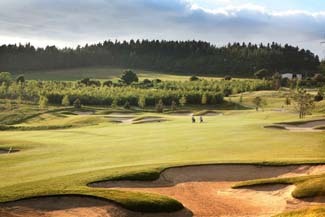 One of the best courses in Ireland, the 27 hole championship course has been designed to allow different combinations of the three nine hole courses to be played. For the professional and club golfer alike, a thrilling experience awaits with the wonderfully inspiring backdrop of the Wicklow mountains. The course is complemented by our “State of the Art” Golf Academy, an extensive practice facility allowing golfers to hone their skills before putting them to the test on the course. Renowned course architects Hawtree Limited have created one of the most beautiful and challenging courses in Ireland within easy access from Dublin. The three nine hole courses starting and finishing close to the clubhouse, allow different course combinations to be played. The championship courses played from the blue tees range from 6543 to 6281 metres. 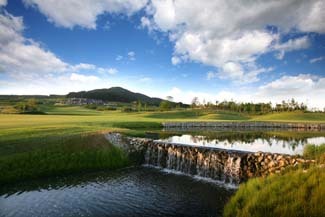 However with five sets of tees, the course offers a challenge for every level of golfing ability. The USGA standard greens are large, many are 40 metres long and the course layout, gradient and cleverly placed hazards ensure that one must consider a number of factors, including wind conditions, when planning the next shot. Golfers are guaranteed enjoyable new challenges on every hole, and be warned the magic of the course and Ballyman Glen will call you back! The Upper Nine is possibly the most exhilarating with magnificent expansive views of the Sugar Loaf and the Wicklow Mountains. 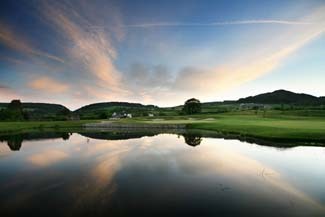 Beautiful lakes, ponds and streams abound on the Middle nine where club selection and accuracy are rewarded. The Lower course is the shortest of the three nines, however the large undulating greens reward those whose short game excels.